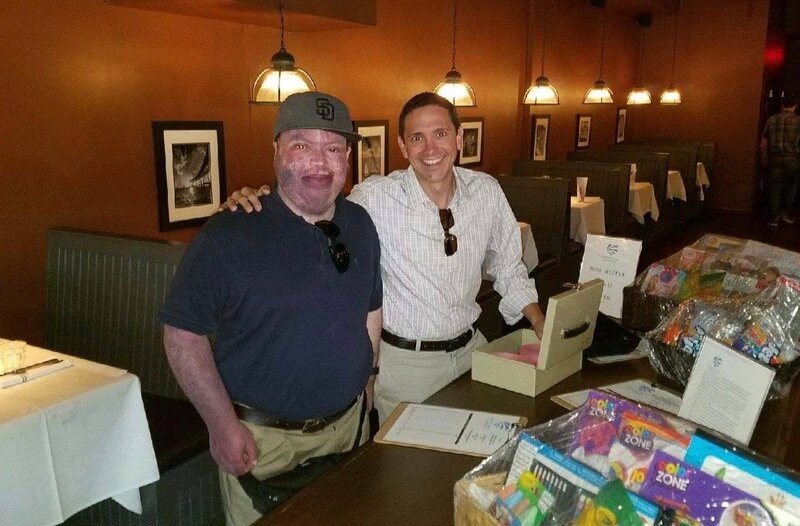 In August, Al DeCesaris took on an exciting endeavor in honor of his niece Jenna to raise awareness and funds for Sturge-Weber Syndrome (SWS) research. His 31-day, 555-mile ‘Hiking Camino de Santiago For A Cure’ journey began in St. Jean Pied-de-Port, France at the base of the Pyrenees Mountains and had him hiking the historic Camino de Santiago across the Iberian Peninsula to the Cathedral of Santiago de Compostela in Galicia, Spain before reaching his final destination of Cape Finesterre overlooking the Atlantic Ocean. 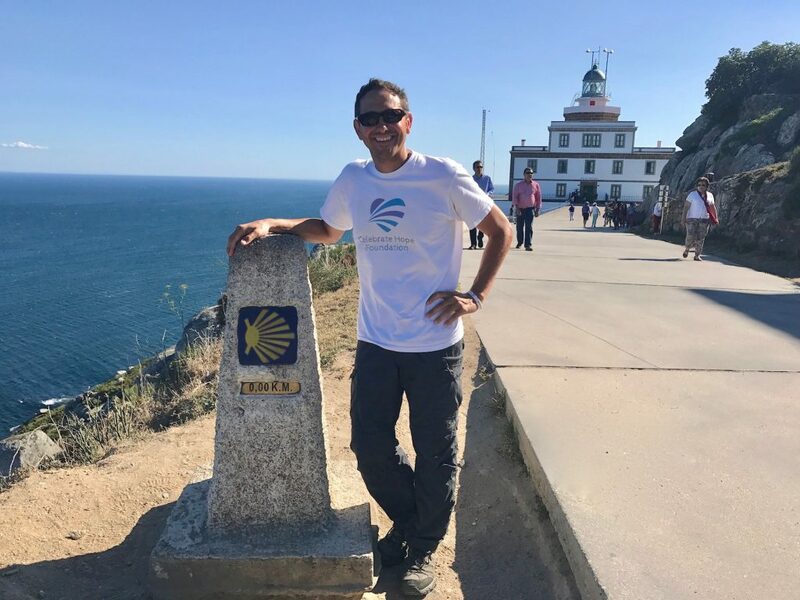 Each day of Al’s journey of hope across Spain was dedicated to a different person living with SWS, and led to a greater understanding of SWS, engendered acceptance of those living with the disorder, and raised critical funds for medical research to further the efforts to find a cure. Join the fight against Sturge-Weber Syndrome by making a tax-deductible donation to Celebrate Hope Foundation. Funds raised from HIKING CAMINO DE SANTIAGO FOR A CURE support medical research being conducted at the Hunter Nelson Sturge-Weber Syndrome Center at Kennedy Krieger Institute. Each day of Al’s journey across Spain is dedicated to an individual living with Sturge-Weber Syndrome DOUBLE-CLICK on the map location markers to read their heartfelt stories and view their photos. Day 15 (8/15/17): Moratinos to Reliegos [40.8 km] -- Hike for Jaxon. Day 31 (8/31/17): Muxía to Finisterre [28 km] -- Hike for Rylie. Day 24 (8/24/17): Barbadelo to Ventas de Narón [31.2 km] -- Hike for Jesús. Day 30 (8/230/17): Olveira to Muxía [31.6 km] -- Hike for Alex. Day 21 (8/21/17): Ponferrada to Trabadelo [34.2 km] -- Hike for Pia. Final Destination (8/31/17): Finisterre -- Hike for Sofía. Day 29 (8/29/17): Negreira to Olveiroa [33.3 km] -- Hike for Alma. Day 23 (8/23/17): Biduedo to Barbadelo [31.9 km] -- Hike for Paul. Day 2 (8/2/17): Roncesvalles to Larrasoaña [28 km] Hike for Africa. Day 22 (8/22/17): Trabadelo to Biduedo [32.9 km] -- Hike for Odri. Day 3 (8/3/17): Larrasoaña to Zariquigui [26.6 km] -- Hike for Jeremiah. Day 17 (8/17/17): Leon to San Martin [26 km] -- Hike for Lola. Day 4 (8/4/17): Zariquigui to Villatuerta [31.7 km] -- Hike for Alejandra. Day 18 (8/18/17): San Martin de Camino to Astorga [23.8 km] -- Hike for Nico. Day 6 (8/6/17): Torres del Rio to Logrono 23.6km -- Hike for Pablo. Day 19 (8/19/17): Astorga to Foncebadón [25.9 km] -- Hike for Anabelle. Day 8 (8/8/17): Nájera to Grańon [27 km] -- Hike for Dario. Day 16 (8/16/17): Reliegos to Léon [24.3 km] -- Hike for Leire. Day 9 (8/9/17): Grańon to Villafranca de Montes de Oca [27.7 km] -- Hike for Addisyn. Day 20 (8/20/17): Foncebadón to Ponferrada [27.1 km] -- Hike for Jameson. Day 11 (8/11/17): Castańares to Hornillos del Camino [29.8 km] -- Hike for Connor. Day 1 (8/1/17): Saint-Jean-Pied-de-Port to Roncesvalles [24.7 km] -- Hike for Jenna. Day 10 (8/10/17): Villafranca de Montes de Oca to Castańares [31.4 km] -- Hike for Fran. Day 25 (8/25/17): Ventas de Narón to Boente [32.2 km] -- Hike for Arayah. Day 12 (8/12/17): Hornillos del Camino to Boadilla [39.2 km] -- Hike for Ivet. Day 28 (8/28/17): Santiago to Negreira [21.9 km] -- Hike for James. Day 13 (8/13/17): Boadilla del Camino to Carrión [26 km] -- Hike for Cindy. Day 14 (8/14/17): Carrión de los Condes to Moratinos [30 km]] -- Hike for Laia. Day 26 (8/26/17): Boente to Amenal [27.5 km] -- Hike for Juan.